Hello, and welcome to the Bednar Digital Humanities Research Team at Penn State’s website. 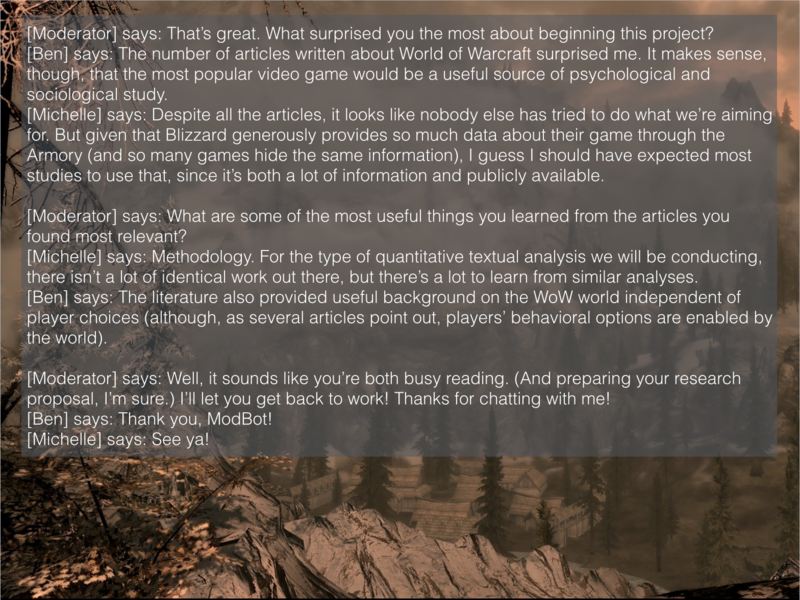 Please read the appropriate invitation below (Roleplay or Non-Roleplay) to learn about our study on language in WoW. For more information, see Study Info and Background and FAQs. If you don’t find what you’re looking for, you can head to the Forums to ask a question or view and participate in ongoing discussions about the project. To learn more about the research team, please visit our About Us page. Reach us though email at bednardigitalhumanities@psu.edu. The submission link for chat logs and instructions on preparing them can be found at Chat Log Submissions. Scroll down further for blog updates on the study’s progress. 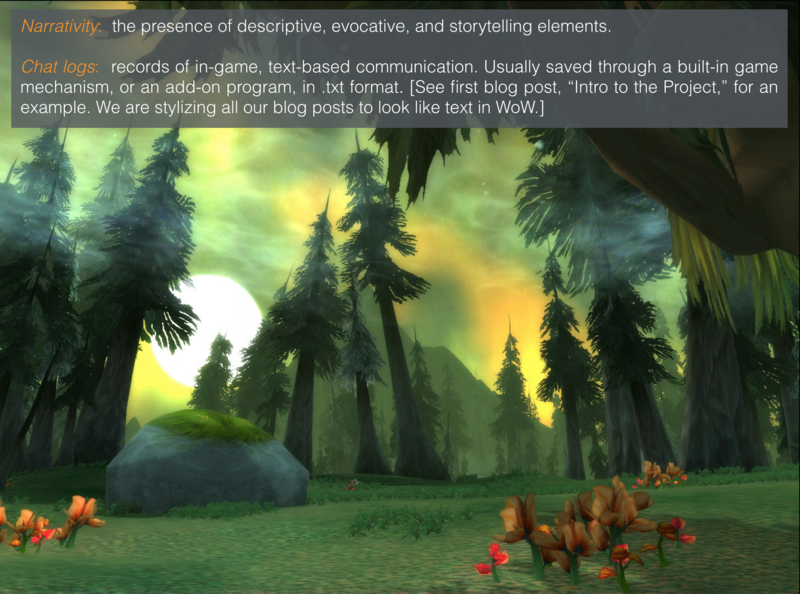 We are a research team at the Pennsylvania State University studying the complexities and possibilities of roleplayers’ text-based communication in World of Warcraft. 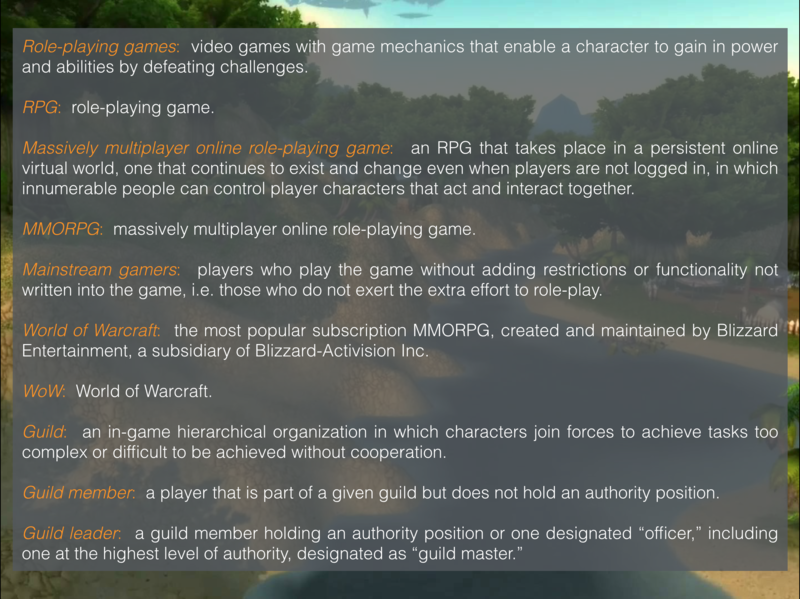 If you engage in any amount or type of roleplay in WoW, you are invited to participate. Participation in this study is voluntary, and all responses will be confidential. 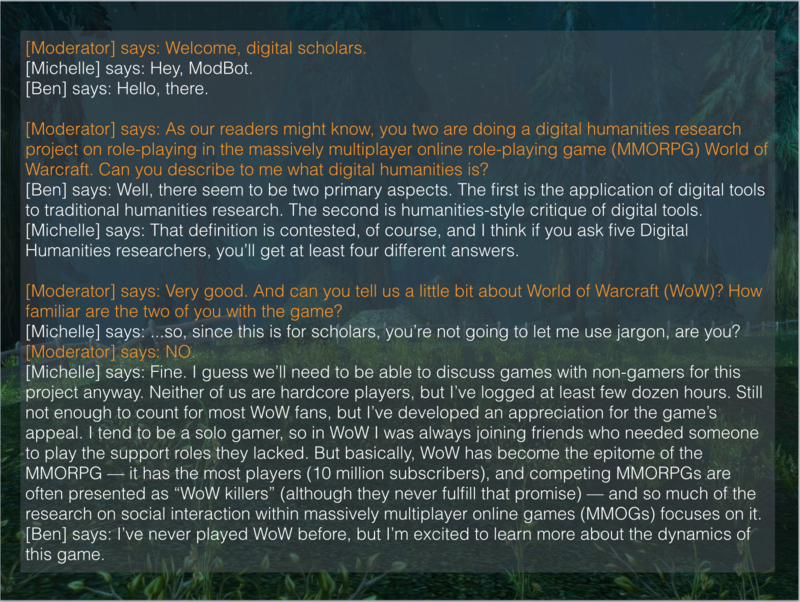 Although you may not benefit personally from the study, the results will help shed light on the unique forms of social interaction that roleplay adds to MMORPGS such as WoW and that are often overlooked by non-gamers. If you would like to volunteer chat logs, please submit them in .txt format (your-character-name-or-an-alias.txt) to this secure Box at Penn State link. As many chat logs as possible is preferred, but any and all are appreciated. We’re reaching out to guilds to see if any are interested in donating text chat logs for a study by Penn State researchers on communication in WoW — specifically, on similarities/differences between the language of mainstream players and roleplayers. The study is the first of several we hope to do in order to shed light on the unique forms of social interaction in MMORPGs that are often overlooked by non-gamers. We have already collected chat logs from roleplay guilds, and are seeking logs from guilds focused on PvE, PvP, raiding, etc. for comparison. The logs can be from any channels, scenarios, or timeframes so long as they are not roleplay. Any and all are appreciated. Chat logs should be submitted in .txt format (your-guild-name-or-alias.txt) to this secure Box at Penn State link: sites.psu.edu/narratingplay/chat-log-submissions/ Your guild’s contributions will be acknowledged in any publications that result from the study, if you wish it. 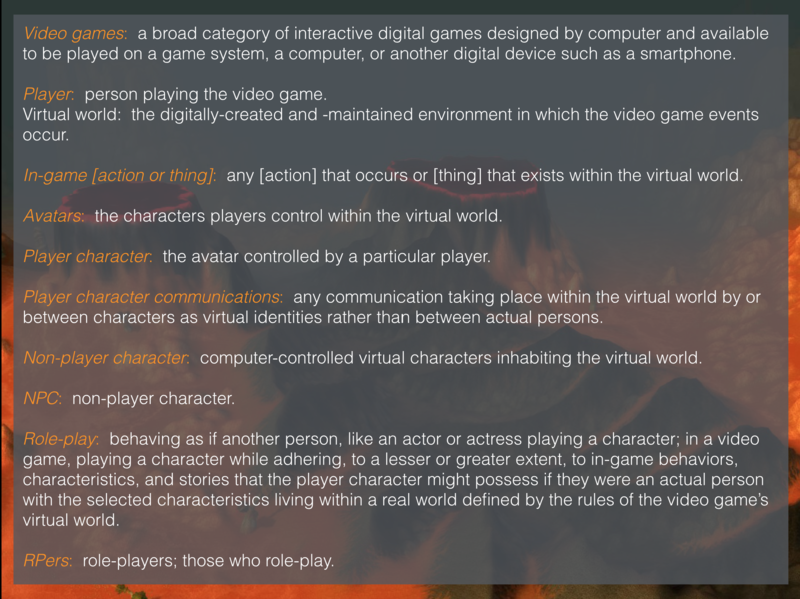 If you’re unfamiliar with video games or role-playing games such as World of Warcraft, the following terms will be useful to you in understanding our upcoming posts. Also included are terms relevant to the narrative focus of our project. What are the motivations / purpose for the project?